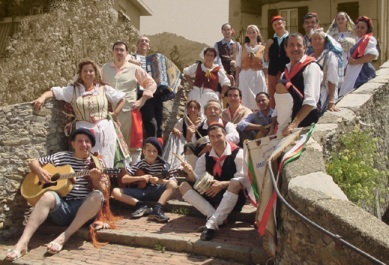 The folk group "Amixi de Boggiasco" (Bogliasco Friends) was founded in 1975 thanks to an enthusiastic band of pals who aimed to research, keep alive and spread popular musical and traditions from Liguria, and particularly Levant Riviera (east coast of Genoa). In this area we can find Golfo Paradiso (Paradise Gulf)- (between Genoa and Portofino)representing, with its hinterland, the geographical zone from which the members of this Group come. The group has about 25 members and performs its shows dressing typically regional costumes, restored on the base of historical documents and which take back to every day life at the end of XVIII century and the beginning of XIX. 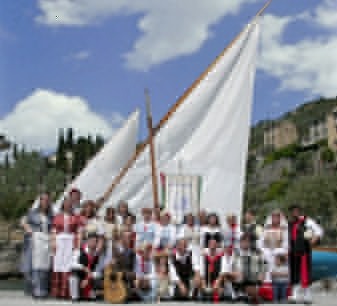 The repertoire of the group is composed of songs chosen among the most representative in dialectal tradition of Liguria and of old dances restored according to careful research carried out in many parts of the region, supported by authentic testimonies, and then adapted to be presented in public. The musical accompaniment is made by accordions and guitars as well as handmade instruments like Harness-bells, spoons, bells, strange wooden little boxes beating on which it is possible to evocate horses tramping when, in the good old days, they pulled coaches, or better, "tranvaietti"(little trams) and "zonzuri", similar to the Neapolitan "caccavella", once played by young people to substitute double-bass during festivals. The group since 1984, every year organize a festival with international change dedicated to the memory of the first leader Attilio Vivaldi.